Tracy Taddey, D.D.S.,John Taddey, D.D.S. Do you want the perfect smile? Many people do, and here at La Jolla Family and Cosmetic Dentistry, Dr. Tracy and Dr. John J. Taddey have rebuilt the beauty and function of smiles. Serving La Jolla and the surrounding communities, dentists Tracy Taddey and John Taddey offer exceptional general and cosmetic dental services to help you reach that goal of perfection. Part of our mission and our commitment to serving our patients at our La Jolla Family & Cosmetic Dentistry, includes providing information that helps them to make more knowledgable decisions about their oral health needs. We pride ourselves in providing quality, modern, friendly, and gentle dental care at affordable prices. We offer early morning office hours to better fit your work schedule, and convenient validated underground parking. Take advantage of our promotions and specials available for both new and current patients. Please browse through our website and be sure to call us at La Jolla Family & Cosmetic Dentistry if you have any questions or would like to schedule an appointment. Tracy Taddey, D.D.S. & John Taddey, D.D.S. 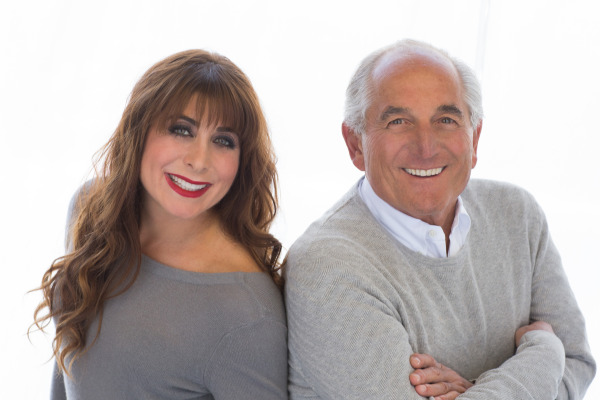 Doctors Taddey and Taddey are passionate about giving you a beautiful smile makeover, right here in La Jolla serving San Diego and North County. Through personalized treatment plans, our aesthetic procedures can help you feel like a star! In addition, Dr. John is a recognized expert in treating Temporomandibular Joint Disorders. He has minimally invasive treatments that help manage TMJ disorders orthopedically, guarding you against teeth grinding, jaw clenching, and more. If discomfort or pain at the dentist is a fear of yours, you are not alone. Many people worry that visiting a dentist is full of uncomfortable, painful, procedures; this fear can be so strong that people resist getting the help they need. Dr.'s Taddey are firm believers in comfort dentistry. Our office features a relaxing, spa-like atmosphere, complete with a beautiful ocean view. Just waiting for an appointment is often enough to put our patients at ease. If you need something stronger, though, we provide both nitrous oxide and oral conscious sedation during particular procedures. John J. Taddey, DDS serves La Jolla, University Towne Center, Pacific Beach, and Del Mar; San Diego’s North County no longer has to worry about their smiles! 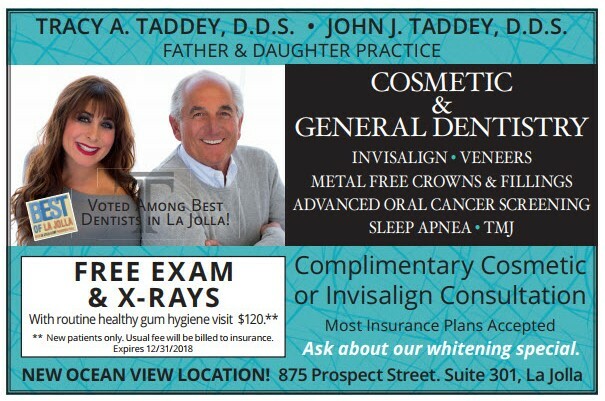 John and Tracy Taddey can give you the smile you want and need, so there is no reason to avoid the dentist anymore. Take the first step to a perfect smile and call us today! Tracy Taddey, D.D.S. | John Taddey, D.D.S. Dr.Tracy Taddey, D.D.S and Dr. John Taddey D.D.S. La Jolla Family and Cosmetic Dentistry. Are dental professionals dedicated to General, Family & Cosmetic Dentistry such as Dental Exams, Cleanings, X-rays, Fluoride, Dental Makeovers, Teeth Whitening, Veneers, Crowns, & more. Please come and visit La Jolla, CA dentist John Taddey, DDS.